On Our first date, My hubby took me to Red Lobster. It was my first time there. 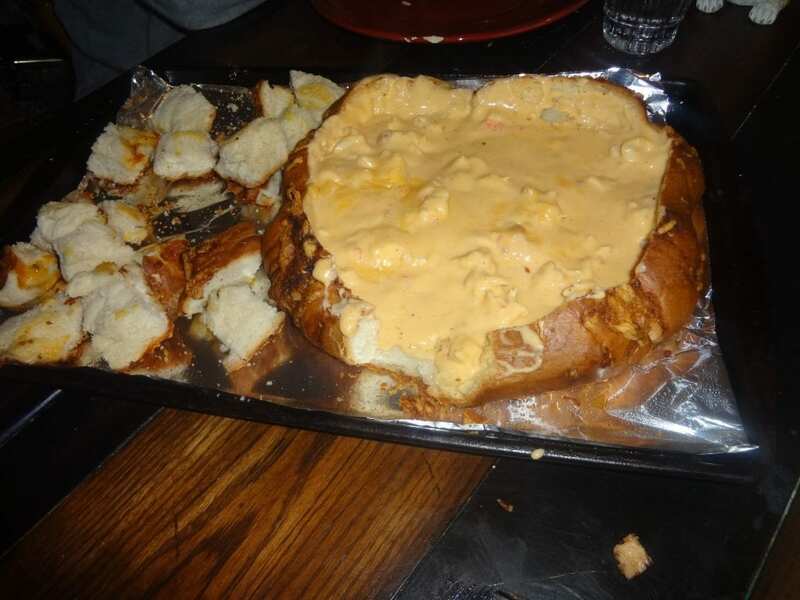 He ordered this delicious appetizer that was a seafood dip in a bread bowl. Then we had the Admirals Feast with assorted seafood and of course, we had the salad and cheesy biscuits. We had blue drinks in a cute glass that looked like a light-house that he bought, and I got to bring them home. It was so much fun, and so romantic. We have returned many times some just to have the bread bowl and wine. I had a lobster tail in the fridge and decided to try to recreate this. I found a few cheese fondue recipes and combined a few to make my own. I used a pot on the stove, but you could do it in the microwave. This dish can be done in under thirty minutes, but is definitely not a budget meal. It does serve more than two so you could make it for a party. Here is the recipe I made. a bread bowl ( large round sourdough or even a loaf of french bread baked and hollowed out could work) if you can’t find a bread bowl served in a dish and eat with the toasted bread cubes or some garlic or french bread) My husband said he would have liked crackers. Hollow out the bread bowl or loaf cut the remaining bits into bite sized chunks. Spray it all with buttery spray and bake. In a saucepan over medium heat melt butter, Cheeses and soup with milk. Stir constantly so it doesn’t burn or scorch. Add seasonings to taste, cooked lobster and pour into the baked bowl. All done! Now light some candles and sit to a romantic feast. This can be an appetizer, but it made so much I decided to make it a fondue meal. We used a spoon to eat some as soup and used the bread to eat some as a dip. Next time I think I will halve it. What did you have on your first date that brings back memories? Have you tried to make it at home? As Always~~If you can Dream It~~You can do it! That was nice of you! Thanks for dropping by! Red Lobster is one of my sons very favorite places to eat. I’m not too much for seafood, but I do love it southern fried. I know you are a great cook and can make about anything, Cathy! I love southern fried too of course but i try to not indulge the fried much!